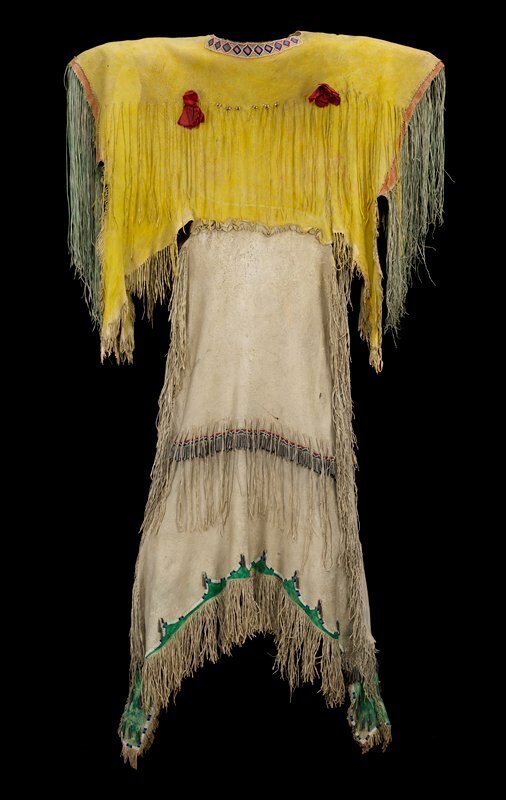 This dress, stitched together from four brain-tanned deer hides, was made by a Kiowa woman artist for a particular person, most likely a close relative. The maker of the dress maintained the forms of the deer within the garment—the finishing tabs on the skirt and arms are from the deer’s legs, investing the wearer with the swiftness and grace of the animals themselves. Hundreds of tin cones are stitched in rows in the middle of the skirt and along the bottom tabs. They acted like bells or chimes; when the wearer of this dress moved, she was accompanied by music. Finely cut fringe finishes the dress, each piece individually applied by the maker.